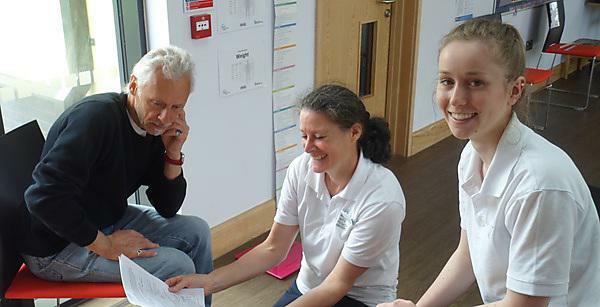 Physiotherapy students are helping over-60s assess their health at a series of Functional Fitness MOTs. Physiotherapy students from Plymouth University are helping over-60s assess their health at a series of community events. The Functional Fitness MOTs are being carried out in Totnes and Dartington over the coming weeks, where participants are taken through a variety of tests that will give an indication of their exercise performance. The tests, which include flexibility, muscle power, balance and aerobic endurance, come with a set of normal values for people of different ages to give them an idea of whether they are doing well compared to their peers, or whether they could benefit from being more active. Participants then receive a free personalised workbook of results and will learn about local physical activity and exercise opportunities in and around Totnes and Dartington. The Functional Fitness MOTs are a not-for-profit project hosted by Zest Physiotherapy for Life, which specialises in physiotherapy for older people. The first event took place at the Rushbrook Centre in Totnes on 18 May, with more than a dozen people attending. "Through my work as a physiotherapist, I know people want to stay active as they get older but often don’t know what is available in the area and what would suit them best. The Fitness MOT is a great way to give an indication of their exercise performance and whether they are doing well compared to peers, or could benefit from being more active. For further information visit Zest Physiotherapy online. We encourage and support a range of voluntary, additional opportunities that may enhance employability and professional development. These include providing physiotherapy services at events such as the Plymouth Half Marathon, Plymouth 10K and assisting court side with Plymouth Raiders Basketball Team, plus supporting students in their own charitable and community engagement, underpinned by the Plymouth Award. Physiotherapy students in years two and three have the opportunity to volunteer to assist the Plymouth Raiders Team Physiotherapist Kiah Rosenstein in providing therapy. This could include taping and stretches prior to matches and also being present courtside during the game in case of injury. One of the students who volunteered was third year Helen Greensmith "It was a great opportunity to put into practice some of the physio skills learnt on the course and witness the players’ physical and psychological preparation before the game". The teaching and support on the course were fantastic! "There was a steep learning curve to the practical skills but we had lots of time to practice on each other."